The artist behind a piece of floating artwork in the Fort Point Channel is awestruck today after his ocean-themed art project may have saved the life of a man who jumped into the water early Wednesday morning. Police say a man, identified as 29-year-old William Thoresen, of Shirley, jumped into the Channel at around 3 a.m. Wednesday morning after he allegedly broke into a building on South Street, then stole a taxi cab at South Station, injuring another taxi driver in the process, and drove the car to the nearby Summer Street Bridge before leaping into the chilly water below. 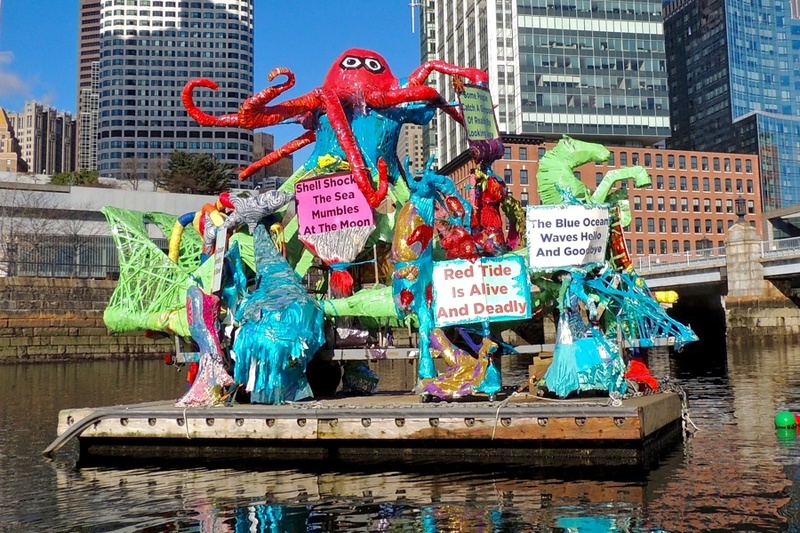 Police later found Thoresen had taken refuge on the artwork, a barge covered in sculptures of colorful sea creatures called the Create Coral Reef II. The man was taken to a nearby hospital with undisclosed injuries. He faces a number of charges, including carjacking, assault and battery, and breaking and entering. Police have not offered an explanation for his alleged bizarre behavior. We’ll never know if the floating artwork saved him from drowning, but anyone plunging into the freezing cold waters would not have had many options for things to grab onto in the channel, a long, wide waterway not designed for swimming, with tall stone walls on either side. It almost wasn’t there. An earlier version of the artistic coral reef, built in the hull of a sailboat, was removed from the channel in October after high winds caused it to capsize. After towing the damaged artwork back to his studio in Fitchburg and raising some $4,000 from friends and supporters for materials, Beck and his crew constructed a sturdier version on top of a barge, and had only set it up in Boston this past Friday. Beck, who says he is recovering from surgery for a knee injury he sustained while fixing up the artwork, says this is just one more example of public art impacting the world in unexpected ways and, weirdly enough, another way to reach a wider audience. It’s unclear how long Create Coral Reef II will remain in the water. Beck says he’s asked the Fort Point Arts Community, which commissioned the piece, to be allowed to keep it there through the spring.